I hope you will enjoy reading about our wonderful British adventure 🙂 we thought youd like to hear about Aunty Rocky’s workshop in Cheshire which Fiona, Soheyr Azar and I [Ruth] attended. On Friday the 19th of September I began my pilgrimage to Congleton in Cheshire via Manchester airport to meet up with my host and Aunty Rocky. After jubilous greetings and salutations we all made our way back to our host’s house [Jean Young] and talked dance. 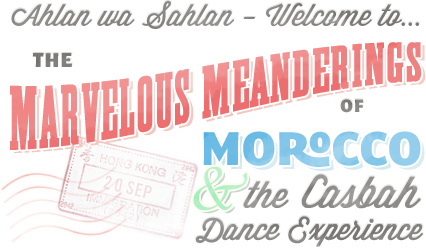 After a few videos of, you guessed it, dance, 🙂 we retired ready for the workshop the following day. Apart from the excitement of finally getting to meet Aunty Rocky, Soheyr Azar and Fiona from Oxford, [fellow listers] I was looking forward to learning some new choreography and having a full day of dance. 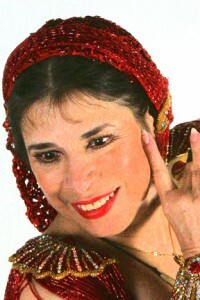 Rocky taught us an Orientale routine which I loved and her teaching style suits my learning style, i.e. I like the ‘building blocks’ approach of learning a part then adding to it. I had heard so much good stuff about Rocky’s approach to teaching it and here I was experiencing it. She has a magic of her own and a love and enthusiasm for the dance which is infectious. At the same time she is a thorough and instinctive teacher, ensuring everyone got a chance to dance ‘front line’ so that she could correct and praise, an essential ingredient in building confidence. A good part of the day was taken up with choreography with some time towards the end of the day for some good basic sagat. The best part though was the opportunity to see Rocky perform. After we got back from lunch, we had a wonderful treat and watched her perform in her ‘Madame Abla’. Just wonderful and certainly a performance I’d love to aspire to. Sunday we learnt a second routine which was a real bouncy number that is still going round my head:) The spins threw me a bit but apart from that, I loved it. Then we all sat down whilst Rocky told us about Guedra and its history, why and how it is performed together with some amusing anecdotes about the Marrakesh Folk Festival. Then our final treat of the day was to have Rocky perform Guedra for us. I’m now going to hand over to Soheyr Azar and Fiona for their thoughts. Ruth has already told you what a great time we had and how wonderful it was to meet list sisters. I would just like to add a few more kudos on Aunt Rocky’s seminar. The Saturday class was a lively Oriental number to ”Eh Yaani”, by Amr Diab. Morocco added immensely to our understanding of the song and the dance by translating part of the song. The choreography tied in nicely with the music, taking advantage of the breaks. As always, Rocky’s choreography makes you love the dance even more and feel THIS is why I dance. The dance performance left us all inspired to get back to our dancing, and a class in Sagat. Saturday night, though not part of the Workshop, we had dinner at a local Persian restaurant to become better acquainted. 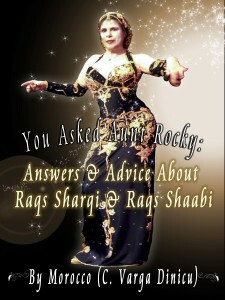 Aunt Roq had us in stitches with her tales of Hatshepsut, falling asleep in the middle of her routine, and Who’s Who in Egypt. Good food, good conversation, good company. All we needed was a chance to dance. Sunday Aunt Rocky gave us that chance. We danced a delightful Saidi dance to “Amouna fi Said”. Aunt Rocky had already told the list earlier that this song is about a girl, Amouna from the Said, who is SO SWEET (helawa). The singer (as her boyfriend) saw Hashmi talking to her and is going to hit him over the head with a big stick, because she is HIS Sweet, Sweet, Sweetie. The music and routine are lively and fun. When we came back from lunch, Morocco was dressed in a theatrical Guedra outfit. She told us the history of the dance, the Tuareg who perform it, her involvement with them (including a month living with them), how her live music came to be recorded, and the meanings of the dance movements. Then she danced for us. It was very moving and awe inspiring. Then we had a chance to attempt to send our blessings through the Guedra. It was very powerful, just in the attempt. To participate in a real Guedra must be almost overwhelming. Thank you, Morocco, for a most enjoyable weekend. And Jean Young is also to be commended for being a fine sponsor and allowing us to have this opportunity. And it is great to turn cyber-sisters into true Sisters in the Dance. Fiona now – always the last! I started my “pilgrimage” indecently early on Saturday morning, dragging my husband with me. After a journey that took slightly longer than expected, I snuck into the hall at the back, recognising Ruth from her picture on her web page, and, strangely, just guessing correctly who Soheyr Azar was! As the last one to add to this long post, there’s not much more I can say about the technical detail of the workshop. However, here are my impressions. I was surprised how easily I could remember parts of the dance. Aunty Rocky told us we’d hate her by lunchtime, but how wrong she was. Her method of repeating the whole dance, four times, *from the top* every time a new step is added, really does make it sink in, and flow together. It may well be exhausting, but it certainly works. I’ve never taken in a choreography so easily before. The steps also went so well with the music that it reminded me quite clearly what to do. It was quite a large class and a large hall, so, having come late and ended up at the back, I found myself missing a lot of moves. However, on Sunday it was clear that Aunty Rocky had noticed the difficulties the back markers were having, and kept getting us to swap positions. By the end of Sunday, most of the class was flagging a bit, but, Aunty Rocky showed not one sign of tiredness. Her energy was certainly an inspiration to keep on trying, long after my feet had worn out and were swathed in plasters. But this makes it all sound rather gruelling. It was certainly hard work, but it was also great fun. If I hadn’t been enjoying myself so much there’s no way I would have kept going to the point of being ready to drop!! I don’t think I’d ever truly *danced* through a choreography before this weekend. Yes, I’d improvised with feeling at home in the living room, but never bounced my way through a set of pre-defined steps with so much enjoyment. The other parts of the workshop were good too: For me, the highlight of Aunty Rocky’s Saturday performance was that she showed just how good zills are when played properly. I’m pretty much resigned to remaining hopeless with them, but did improve a teeny bit under Aunty Rocky’s instruction, and was pleased to find different ways of playing them. It was also amusing to hear of how to torture your enemies with zills (121,121,121,121….) and how to practise them without forcing your loved ones to leave home. But, on the contrary, for me the warmth coming from those “lightning bolts” was tangible and I found it a very moving experience. And as for Saturday night’s dinner, I’m still chuckling. Thanks so much to Jean Young for organising this and the workshop. So, was it worth 5 hours of sitting on the M6, (crowded British motorway), 40 pounds for a B&B and the grovelling I had to do to get out of going to work on Sunday? – Definitely.